Cape Town - Kaizer Chiefs have revealed that Khama Billiat and Leonardo Castro are both struggling with a calf injury whereas Mulomowandau Mathoho and Lebogang Manyama have returned to training. 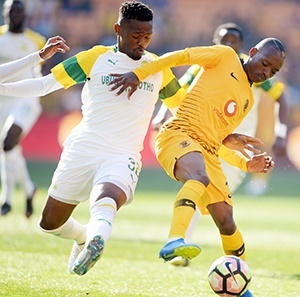 Billiat and Castro picked up their problems during last Sunday's Nedbank Cup quarterfinal victory over Cape Town City. In addition, up-and-coming youngster Happy Mashiane is out of action with a toe injury for the Glamour Boys. The club's physiotherapist Dave Milner told the team's official website: "It concerns the calf area (for Billiat). The pain is subsiding, but we are watching him closely. He will undergo a late fitness test on Friday. "Castro is also under scrutiny. He picked up a comparable knock. He's being monitored, and a decision will be made on his readiness to play this weekend." Meanwhile, the site stated that Mathoho and Manyama have returned to full training after their respective injuries. In conclusion, Milner added that goalkeeper Itumeleng Khune was making progress from a shoulder issue though he remains out for the rest of the campaign: "Itu saw the doctors on Tuesday. They are happy with his progress." Chiefs are set to take on Baroka on Saturday in a Premiership affair at the FNB Stadium in Johannesburg.